Do I Get a Dental Implant or a Dental Bridge? I lost a tooth. It’s my own fault. I waited too long to deal with it and now I have to replace it. My dentist is suggesting a dental implant, but I’m not too keen on the idea of surgery. Would a dental bridge do something close? It depends on how close you’re wanting to get. Both a dental implant and a dental bridge are acceptable tooth replacement options. Both are permanent and secure. There are important differences though. I’ll explain both options. Then, you can discuss with your dentist what fits your situation best. His job isn’t to pressure you into an option, but rather to give you your options and a recommendation. The final decision is yours. 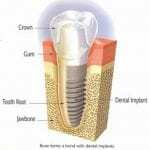 You already knew that a dental implant required surgery. The diagram on the left shows why. As you can see, the implant is placed directly into your jawbone. The benefits to this are it’s like having your own natural tooth back, it preserves your jawbone, and no other teeth need to lose tooth structure for its placement. 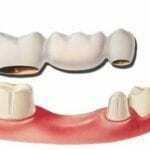 A dental bridge is also permanent however, in order to bond them, it requires grinding down the adjacent teeth. Additionally, if part of it breaks the whole unit will have to be redone. They also do nothing to preserve the bone underneath. When Does a Dental Bridge Make More Sense? While it may sound like I’m suggesting dental implants are the better option, there is a time when a dental bridge makes more sense. For instance, if the adjacent teeth need to be crowned anyway then it’s like getting two procedures in one. Then, you’re not grinding healthy tooth structure. The key is good communication with your dentist. He or she knows your teeth. If finances are a consideration as well, many dentists will let you pay out a procedure like dental implants which are a little more costly than simple procedures like a filling. Who Should Do Your Tooth Restorations? When you’re looking at replacing teeth, it’s important you choose the right dentist. The especially important when the tooth is in a visible part of your smile. You want it to look natural and beautiful. Not every dentist can pull that off. Look for a dentist who’s accredited with the American Academy of Cosmetic Dentistry (AACD). These are the top cosmetic dentists in the country. One other thing to consider. Once your implant crown or dental bridge is made, the color cannot be changed. If you want a whiter smile, be sure to have your teeth whitened before your tooth replacement procedure is done. That way your restoration will match your bright white smile. Previous PostWhy are my 1-Year Old Porcelain Veneers Staining?Next PostCan I Use Mouthwash With Porcelain Veneers?